THE MINI MILKER is a very popular piece of kit. Now available with dual petrol motor & electric motor. Ideal for freshly calved cows in your calving yard. Don't risk moving your newly calved cows to the milking parlour. Our portable milking machine enables you to milk her immediately and feed her colostrum to the valuable calf within the first few hours of life. How long does it take you to milk your newly calved cow? Did you know that the quality of your colostrum decreases by 3% per hour. This means if your cow calves at 7pm and isn’t milked until the next morning milking, 12 hours will pass and you will have a 36% loss in colostrum quality. Ideal for freshly calved cows in your calving yard. Don't risk moving your newly calved cows to the parlour enabling you to milk her immediately and feed her colostrum to the valuable calf within the first few hours of life. KEY FEATURES OVER OTHER MACHINES:- oil free, 40L churn, 3 wheels, stainless shells (not plastic), vacuum reserve tank. free delivery. Has a 22L vacuum reserve tank rather than just using the space in the frame. 2 large wheels and a third braked wheel making it easier to move the mini milking machine to the cow. Technical Data: 230V - 50HZ 1450 RPM 3/4 HP Monophase Electric Motor, Oil free, Graphite Vained Vacuum Pump Pneumatic Pulsator, 1x40Ltr milk churn, Aluminium/Stainless Steel Construction. The dual fuel mini milker will run on either electricity or petrol. The electric motor is the same as the 'standard' electric mini milker working off a 13amp plug. The petrol engine is a 6.5hp four stroke engine that uses petrol straight from the pump and no need for any fuel additives. The engine runs just slightly above tick-over so that it is not too loud to disturb the cow. 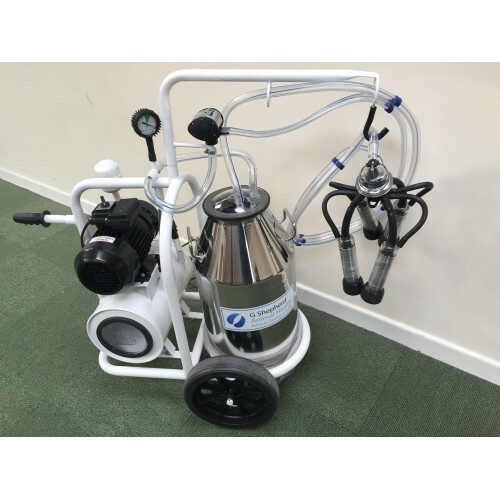 The mini milker is shipped ready to work off petrol, to use it with electricity is very simple, simply remove the guard, release the tension on the drive belt, remove the belt then re-fit the guard. Simple job that just takes 5 mins, tools required are two 13mm spanners and a 19mm spanner. DELIVERY INCLUDED TO UK MAINLAND.